If you are calling from the Mid West to the East Coast (United States), please call after 12 noon your time and please give us your order at least 3 days in advance. If you are calling from the West Coast (United States), please call after 9am your time and please give us your order at least 2 day in advance. We take Visa, MasterCard, & Discover with phone orders. All shipping is done on Monday through Wednesday (except on holidays) by Federal Express 2 day delivery. Please allow 1 day for order processing. Bouquets are shipped anywhere in the United States and arrive on the second day. Remote areas of United States will arrive on the 3rd day. Inquire about Saturday deliveries to west coast states only. For more information about prices and shipping please call our toll free number 1-800-654-7956. Vases are available for the three smaller bouquets only. Vases are $10 each. FREE Shipping via FedEx. You may now order our bouquets online on this website. Simply choose your selection in the “Bouquets” section, add it to the cart and follow the directions to pay online with a credit card or PayPal. NOTE: PayPal is the payment processor we use to take credit card payments. 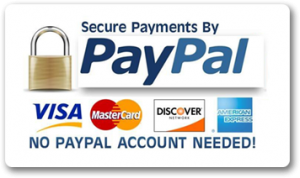 Once you arrive at the PayPal web page for payment, you may choose either of these credit card payment options at that time.